The Mycrocam UK Camera and Drone comes under the beady eye of Angler’s Mail tackle editor Richard Howard. He’s the No.1 products inspector, checking out loads of quality kit every week. This fishing drone is the daddy of them all! 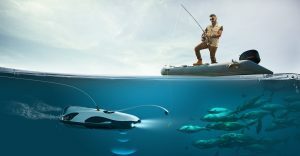 A REVOLUTIONARY fishing drone is coming in the form of a submersible which can find fish, deliver bait, attract fish with lures and film and transmit all that it is doing live to your smartphone!